As is so often the case, the things that are on your own doorstep are the first to be overlooked. And so, somehow, we have never managed to visit the house and garden which is probably closest to us – Quex Park near Birchington-on-Sea. After 6 years we thought it was high time, so we took the train on the short journey between Broadstairs, sometime holiday home of Charles Dickens, and Birchington, final resting place of the great Pre-Raphaelite, Dante Gabriel Rossetti. Quex is a country estate which has made every effort to sustain itself into the 21st century. 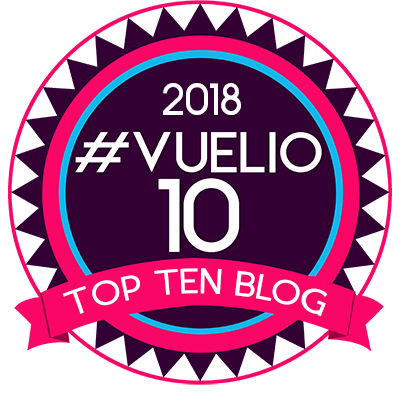 It boasts a notable but quirky natural history museum with staggering displays of taxidermy, a falconry, garden centre, craft and farmers’ markets and a fairly decent family restaurant. During the summer it also stages a number of large music concerts. The gardens are large but not the main attraction in themselves, although that seems set to change. A new garden manager has been appointed and there’s a three year restoration plan in place. The house itself is Regency with Victorian extensions and the interior is something of an acquired taste, heavily influenced by successive owners’ travels in Africa, India and South East Asia. By contrast the gardens are quite traditional in layout, with a fantastic walled garden that once must have boasted every advance in horticulture thanks to its wealthy owners. The sign below outlines when each greenhouse and boiler was constructed. Most remain, in varying stages of decay, but are not too far gone to be saved. Whilst features like a croquet lawn and sunken garden remain, most of the planting in the gardens is now fairly freestyle. There are numerous Buddleja, Phlox, Achillea, Dahlia and hollyhocks (more on those in a later post). What these might lack in rarity they pay back in wildlife appeal. This is a garden that is positively buzzing with life – an achievement in a year when I have barely seen a butterfly other than a couple of Cabbage Whites. Here I spotted Small Heaths, Red Admirals and Commas, as well as bees and dragonflies. 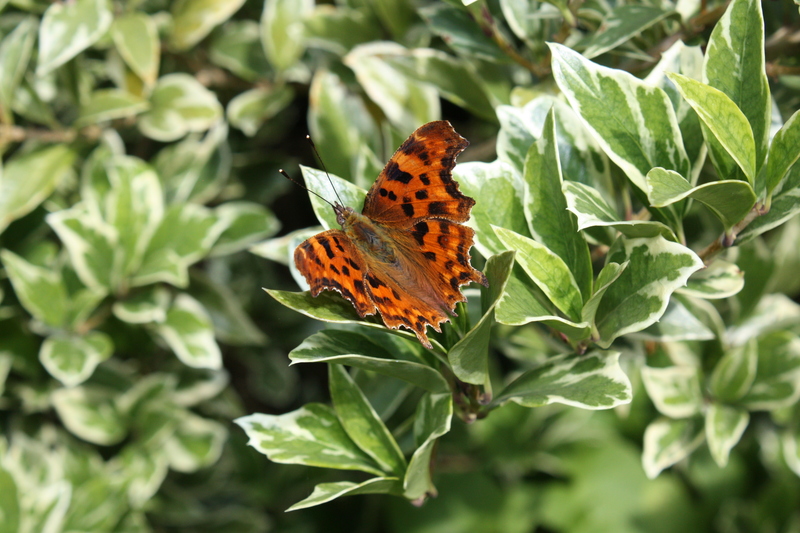 I managed to photograph only one butterfly, the lovely Comma at the top of this post. Even that was quite stressful: butterflies won’t stay as still as flowers! 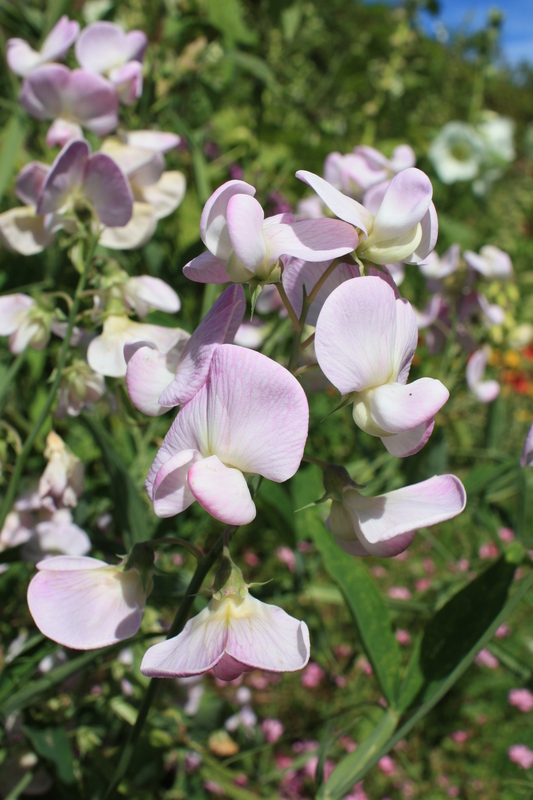 Below, a lovely soft-pink everlasting sweetpea (Lathyrus latifolius) at the front of the long herbaceous border. The walled gardens are now mainly given over to herbaceous perennials, but in one border the planting gets more exotic. Inside the gate visitors are greated by the gigantic 2ft wide leaves of Paulownia tomentosa and Catalpa x erubescens “Purpurea”, its new foliage like shiny black leather. Next door to them an elegant Buddleja lindleyana was covered in long panicles of purple flowers. 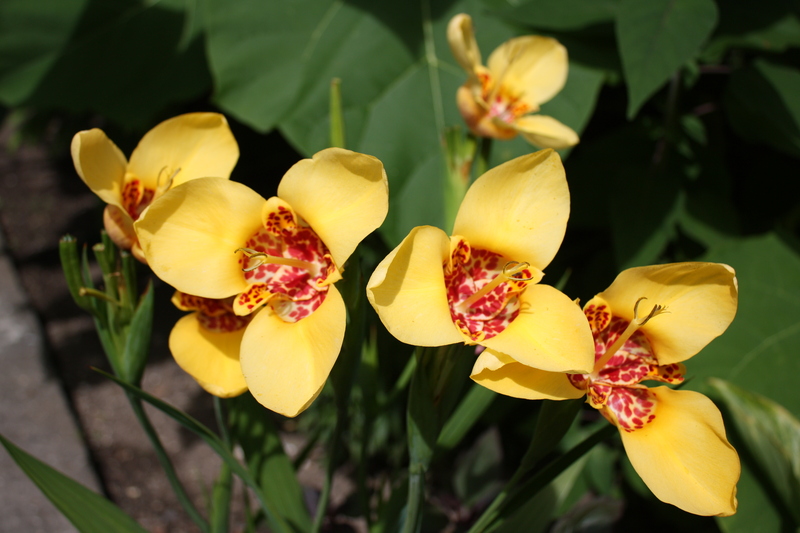 These are underplanted with colourful Tigridia pavonia, otherwise known as Mexican shell flowers or tiger flowers due to their shape and spotted petals. It’s not often one sees these other than in bulb catalogues, but they are very impressive when grown well amongst other exotics. Further into the walled garden this healthy clump of Galtonia candicans stood out beautifully against the weathered wood of a glasshouse and the bright blue sky. It was a day of bright sunshine and breezes, bring the garden alive with colour and movement. 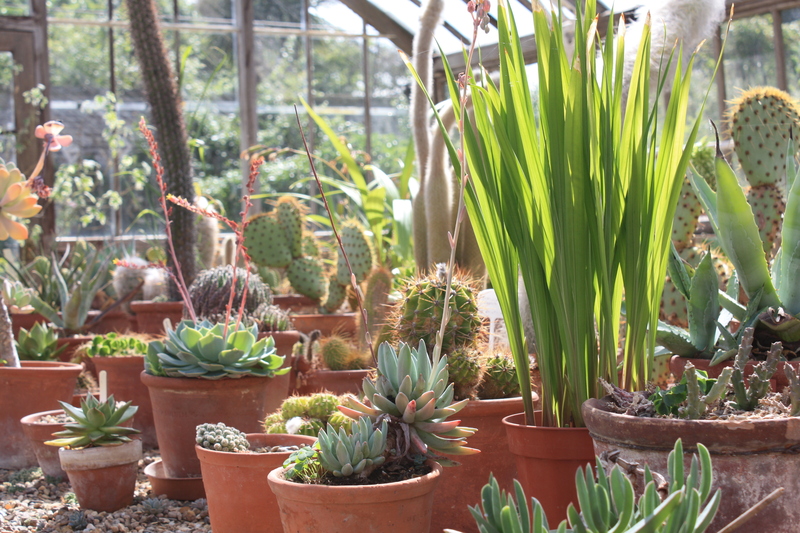 Among the many greenhouses still providing a home to plants was the cactus house. I liked the way the sunlight was catching this collection of succulents, interspersed with potted Eucomis and Gladiolus callianthus. Outside in a sunny border, Aeoniums, Agapanthus and agaves basked in the sun. One potted agave (parryi?) was in full bloom, reaching 8ft into the sky. 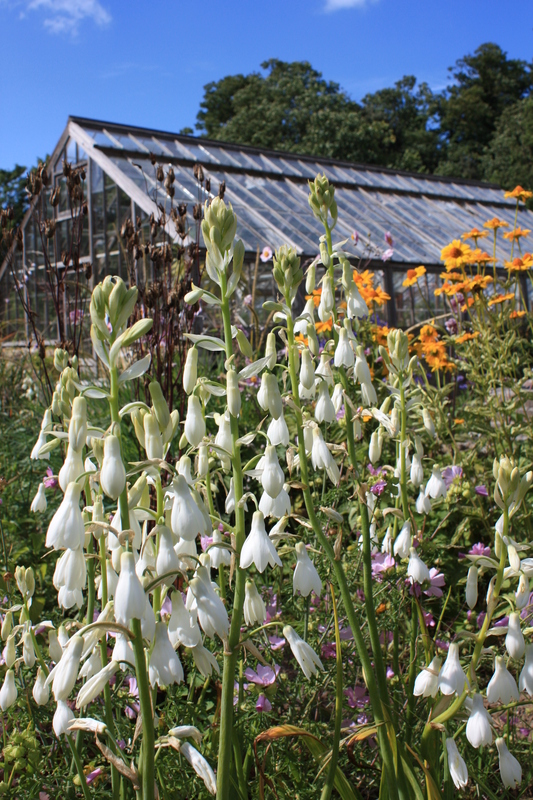 This is a garden with bags of potential – it possesses space, garden buildings of significant historical interest (much like those at Heligan in Cornwall), and some choice established plants and trees. If the new gardening team can build on this over the next few years Quex Park should have another major attraction on its hands. And it won’t be 6 years before we visit again.